We take a look at the best VPNs for CNBC so you can watch abroad, from anywhere outside the United States. CNBC is a popular business and financial news network, and airs shows such as Shark Tank and Undercover Boss. You can access CNBC’s live content using a number of streaming services or directly on the website, but if you’re outside of the US, you will likely be locked out due to geographic content blocking. A Virtual Private Network (VPN) can help you bypass those content blocks, as well as those of other streaming services, such as Netflix, and Hulu. If you’re hoping to watch CNBC in the UK, India, Germany, Canada, Australia, France, or anywhere outside the US, a VPN can grant you access. VPNs route your internet traffic through a server in a location of your choice and encrypt it, replacing your IP address and protecting your privacy. ExpressVPN Our top choice. Unblocks CNBC from just about anywhere with blazingly fast streaming speeds. Apps ensure high standards of privacy and security and are easy to use. 30-day money back guarantee included. NordVPN Veteran budget provider with over 4000 servers and counting dotted across the globe. Good streaming speeds and private. CyberGhost A great value option with some of the fastest streaming servers we’ve tested. Easy to use apps are great for novices. IPVanish 400+ servers based in the US unblock CNBC from abroad seamlessly. Scored well in our speed tests. PrivateVPN Unblocks CNBC, Hulu, Netflix and more from abroad. Strong security and privacy features. ExpressVPN makes your connection more secure while giving access to 33 high-speed servers in the US. These servers are capable of unblocking CNBC, as well as other popular streaming sites like Netflix and Hulu. The available servers are fast enough to support HD streaming. Sharing of a VPN account is made easy since three simultaneous connections are allowed with a single subscription. ExpressVPN employs 256-bit AES encryption which is a well respected and highly effective security measure. While the service stores some connection logs, they are minimal. Importantly, ExpressVPN does not keep IP logs of identifying metadata. To ensure the highest level of privacy and security, the service offers a killswitch which deactivates your internet connection if the connection to a VPN server is lost. In addition, you have DNS leak protection to ensure your information stays inside the encrypted tunnel. For those who want private payment options, ExpressVPN accepts bitcoin payments. The company also has a .onion site which means that it’s possible to register almost completely anonymously. The website for this service contains a large library of helpful FAQs, troubleshooting guides, and tutorials, which can help with setup. If the written guides aren’t helpful, live chat customer service is available for queries which may require the assistance of a human being. You can install ExpressVPN on MacOS, Windows, Linux, Android, and iOS devices, among other devices. Don’t have a device that’s supported? You can manually configure many devices to use the VPN, including certain routers. BEST VPN FOR CNBC:ExpressVPN is our #1 Choice. Reliably unblocks CNBS as well as the most geo-restricted streaming services. Exceptional speeds for buffer-free HD viewing along with total security and privacy. Try it risk-free with the 30-day money back guarantee. NordVPN gives access to over 1,700 US servers. Using NordVPN means that you will secure your internet connection while having access to fast servers which support HD streaming. You can also unblock services such as CNBC, in addition to others like Amazon Prime Video, and Comedy Central. NordVPN supports six simultaneous connections per subscription, which is ideal for sharing the service. This provider stores no logs and makes use of 256-bit AES encryption. DNS leak protection and a kill switch ensure that information isn’t leaked to your ISP. Users can make bitcoin payments for more secure and anonymous transactions. A large database of tutorials and FAQs informs users about a wide variety of topics they may require help with. Customer service is available via 24/7 live chat support and email. Android, iOS, MacOS, and Windows apps are available, in addition to Google Chrome and Firefox extensions. Devices that don’t have native apps can be manually configured. BEST BUDGET VPN:NordVPN is a good value choice. A good all-rounder that works well with CNBC. Strong security features and allows up to 6 devices to be used simultaneously from one account. Includes 30-day money back guarantee. CyberGhost has 700 fast servers in the US alone and allows for streaming of HD content. It can unblock CNBC, as well as other services such as Showtime. Seven simultaneous connections are allowed per subscription. CyberGhost has a no logs policy, and employs 256-bit AES encryption. DNS and IPv6 leak protection come as standard, preventing your private data from being leaked to your ISP. A kill switch protects you in the case of a dropped VPN connection. The service accepts secure bitcoin payments. There is a support page offered which includes a wide range of guides, troubleshooting pages, and FAQs. If the answer to a problem isn’t found there, 24/7 live chat support is available. Apps can be downloaded for MacOS, Windows, Android, and iOS. Devices without native apps, such as some routers and Linux machines, can be manually configured. BEGINNERS' CHOICE:CyberGhost has a simple set up. Unblocks CNBC. Good option if you are looking for a fast, reliable connection and an easy-to-use interface. Can struggle with unblocking other popular streaming sites. 45-day money back guarantee. Around 650 IPVanish US servers mean you can easily unblock services like CNBC, Netflix, and HBO Now. Fast connection speeds enable you to watch your favorite shows in HD. Ten simultaneous connections per IPVanish subscription makes it the most generous option on our list for those who want to share an account. IPVanish offers DNS leak protection and its apps come with a kill switch. These measures prevent data leaks that reveal your true location to the streaming services you’re using. In addition, this service uses 256-bit AES encryption to further protect your connection. IPVanish has a strict no-logs policy to help guarantee user privacy. Bitcoin payments ensure that your transactions are secure and virtually anonymous. A thorough, searchable knowledge database is available to customers, allowing for easy access to information related to setting up and using the service. Support is available through an email form system. Apps are available for Windows, MacOS, iOS, Android, Fire TV, and some routers. Manual setup is possible for unsupported routers, Chromebooks and Linux devices. LARGE NETWORK:IPVanish is easy to use. Offers strong privacy and security with a huge number of IPs and servers plus additional protection against DNS leaks. Fast speeds but not the cheapest on this list. 7-day money back guarantee. PrivateVPN is an effective tool for unblocking services such as CNBC, Hulu, and even Netflix. While it doesn’t have as many US servers as other options on the list, it does provide US servers. One subscription affords users six simultaneous connections. As with the other options on this list, IPv6 and DNS leak protection protect user data through this service. PrivateVPN stores no logs and secures your internet connection, making use of the high-level 256-bit AES encryption standard. Bitcoin payments are accepted. If you need assistance setting up your software or troubleshooting, live chat support is available through the website. PrivateVPN provides remote control support in case customers need an extra pair of eyes to assist with setting up or using the service. You can install and use PrivateVPN with MacOS, Windows, iOS, and Android devices. For Linux systems and routers, manual configuration is necessary. GOOD SPEEDS:PrivateVPN is a good family choice. 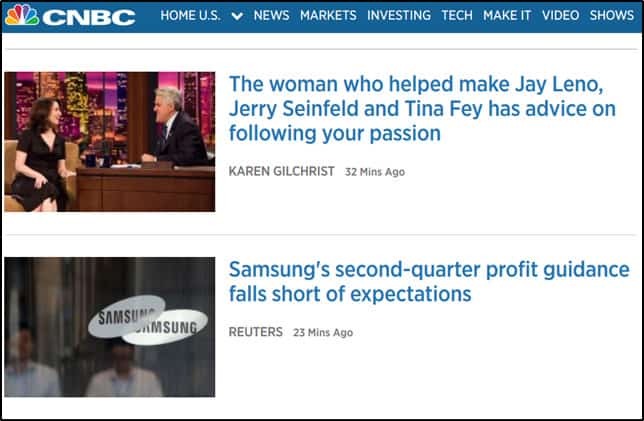 Good for CNBC. Allows up to 6 devices on the same account. Could do with having more servers and lacks 24/7 support. 30-day money back guarantee. Can I use a free VPN to unblock CNBC? A free VPN will probably work to unblock CNBC; however, we generally don’t recommend their use for several reasons. Many of these services use shady practices to make money such as keeping logs and placing ads in your browser. They usually have a smaller number of servers available, and place caps on your data. In many cases, a free VPN will be slow due to too many users stretching the service’s limited capacity. Moreover, some free VPN providers actually carry malware, so can do more harm than good. Why do I need a VPN for CNBC? CNBC has a large library of short videos available which covers a broad range of topics. Alongside the live TV option, full episodes of shows such as Shark Tank and Undercover Boss are also available. 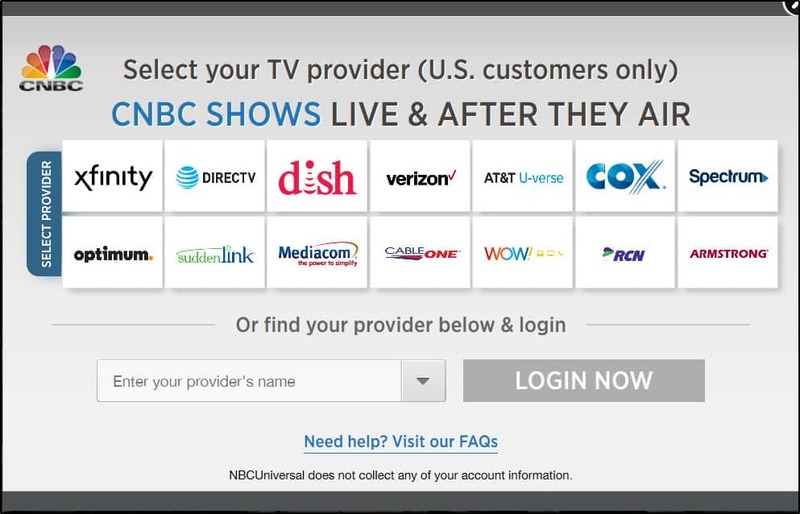 In order to access them, you will need to have a subscription with a US TV provider. However, even with a subscription, if you are outside of the US you will not be able to enjoy live TV or full episodes. If you try to access CNBC’s services outside of the US, you will be prompted to log in with your TV service provider, but you will still be unable to access the service outside of the US. To circumvent this, first, connect to a US server through one of the VPN providers mentioned above, then log in with your TV service provider. Note that if you’re outside the US and do not have the appropriate subscription, you still won’t be able to access some CNBC content, even with a VPN. However, you should be able to view certain free content. What shows are available on CNBC? If you want to catch up with informative business content from the US, Europe, and the Asia-Pacific region and the content is available through the live TV service, then CNBC is your go-to. CNBC regularly covers topics in the international automotive industry, job numbers, and other business-related topics.On-demand content such as Jay Leno’s Garage, The Profit, and Billion Dollar Buyer is also featured. The great thing about CNBC is that even if you don’t have a cable TV subscription, you can still enjoy free content such as podcasts like Fortt Knox with Jon Fortt.